Management at automotive supplier Northern Stamping, which operates stamping and robotic-welding facilities in Northeast Ohio, has negotiated production standards with its union as a condition of employment. Workers pledge to be personally responsible for throughput and quality. In return, management pledges its full support to maintain production equipment to run at peak performance levels. Trailer-hitch work from GM, as well as takeover work from other hitch manufacturers, has fueled Northern Stamping’s growth. The firm operates 70 welding robots working in single-, dual- and quad-robot cells. Every assembly carries an individual lot-traceability stamp (shown here) — the weld-cell operator’s signature. We visited the firm’s 141,000-sq.-ft. robotic-welding facility in Valley View, OH, where technicians devoutly monitor all welding and automation equipment, fixtures, etc., to ensure optimum performance. Management also has instituted individual production incentives to encourage performance above and beyond the negotiated standards. Accountability at every level is what has allowed the plant, primarily a supplier to General Motors, to eliminate two-thirds of its indirect labor related to quality monitoring and control. 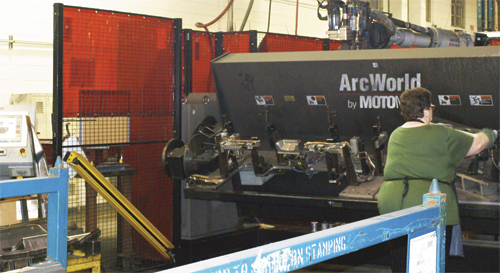 Northern Stamping made its first foray into robotic welding in the mid 1990s when it dove headfirst into General Motors’ GMT800 program, according to company president Matthew Friedman. Among its work for the project was stamping and welding crossmembers and torsion bars, which led to the company opening the Valley View welding facility in 1997. Stampings for the welded assemblies come from the firm’s original plant, a 161,000-sq.-ft. facility in nearby Cuyahoga Heights, OH. The stamping plant was known as Variety Stamping until Friedman’s father and a partner took the company over in 1989. 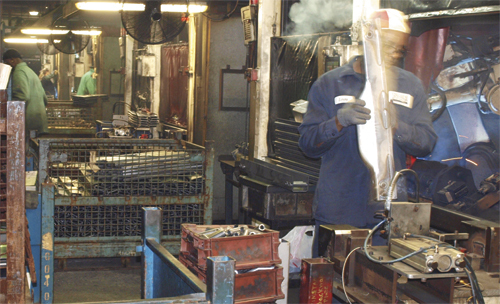 GMT800 business ramped up at Northern Stamping in 1998 and fueled rapid expansion of its new welding facility. 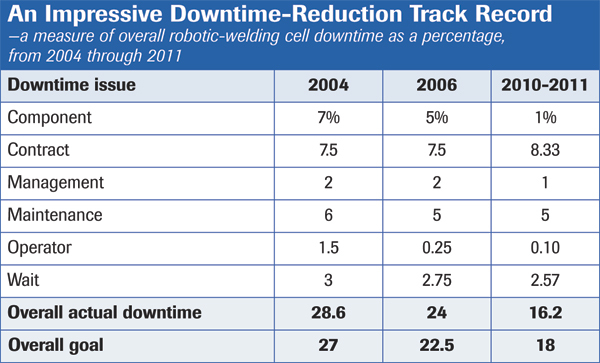 Ten robotic-welding cells, for assembling engine mounts and crossmember torsion bars, landed almost immediately on the plant floor, and another pair of robotic-welding cells had moved in by 2001. “We grew rapidly and significantly,” says Friedman, “but then culture shock hit us in 2004 with the launch of the GMT900 truck platform. That program included a new type of suspension system that reduced our sales volume for the platform by 65 percent, as most of the parts we were manufacturing were designed out of the vehicles. Northern Stamping segments, tracks and records robotic-welding cell downtime by several unique causes: component (poor-quality parts coming to the welding cells), contract (mutually agreed-to downtime, according to the union labor contract, for personal issues), management-related (for training, scheduled meetings, etc.) maintenance-related, operator-related and wait. Trailer-hitch work from GM, as well as takeover work from other hitch manufacturers, led to the installation of another five robotic-welding cells at the facility, including a quad cell with four robots (from Motoman) added in 2009. 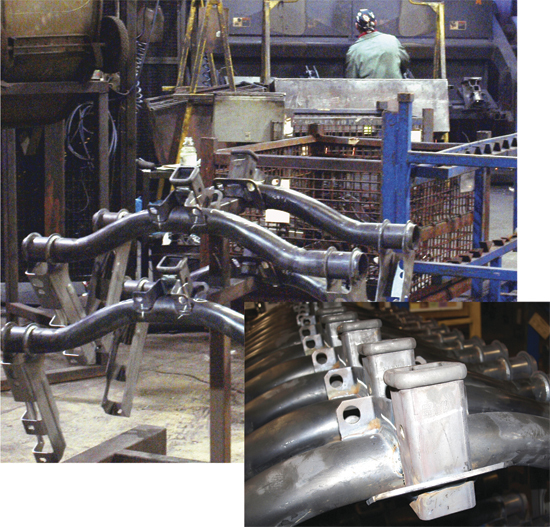 The quad cell originally was commissioned for welding Hummer axle crossmembers, and now is being repurposed for the next generation of GM’s heavy-duty hitches. Also in 2009, the company added its first robotic resistance-welding cell. In total, the welding plant now is home to 70 robots as well as 60 hourly workers—including three welding engineers and three welding technicians—working across two shifts. Slowly but surely, and with impressive, consistent year-over-year results, the company has plugged a at decreasing weld-cycle times, increasing quality and optimizing weld-cell uptime. All the while, it’s shifted responsibility for quality to the operators, while providing the required training to allow this shift in responsibility to occur. The firm can track every detail of every weld cell, says Sheffield, through each cell’s human-machine interface (HMI), including production and downtime, and the causes for any hiccups. Northern Stamping can track every detail of every weld cell through each cell’s human-machine interface (shown here at far left), including production and downtime and the causes for any hiccups. I agree that I have been trained, have read, and will comply with all standard operating procedures, operator inspection instructions and job-safety analyses for operating this cell. Once he clicks the “yes” button, the clock begins to tick. When an operator logs into his cell’s HMI at the beginning of each shift, he must agree to a statement reading: I agree that I have been trained, have read, and will comply with all standard operating procedures, operator inspection instructions and job-safety analyses for operating this cell. As the cells run, managers can access data collected from the plant floor and closely monitor production statistics. “These snapshots tell us the cell number, operator, part number being run, lot size, how many have already run and how many remain,” says Meet. “We can see how many assemblies have been stenciled with the operator’s identifier, and how many assemblies were rejected and why. And we can see log-in and log-out times, hours logged in and current hourly production rate compared to the agreed-upon standard. During production, the cell HMI provides alerts to the operators regarding the required inspection interval. The cell shuts down automatically and prohibits the operator from continuing to run until they perform the required gauge check. As a result of building quality into the process in this , PPM levels have dropped from a monthly high of 176 (in 2003) to a low of 3 (in 2011), where it has hovered for some time. Did you sustain any injuries during this session of operating this cell? A “yes” answer triggers further investigation. From 2006 to 2011, scrap rate at the plant has dropped from 1.2 percent to 0.5 percent, and rework has dropped from 6 percent to 2 percent. ”We recently took over a hitch job from a distressed supplier and when we put it into production, we were blowing out sensors in the weld fixture every other day. Our fixture department was able to quickly identify the problem and relocate the sensor to better protect it from the welding environment. Making that change via an outsourced fixture house might have taken days and impacted our production schedule. Last but not least, the knowledge gained by Northern Stamping’s management team from its production and downtime tracking provides an up-close and personal look at any gaps between the skills and responsibilities of its employees. Filling this gap requires training, and with hard data in hand managers can tailor training to address specific problems. “A recent example,” says Sheffield, “is in the procedures followed to change weld-gun nozzles and tips. A couple of years ago, we were noting excess downtime related to inefficient nozzle and tip changes. Operators often were manhandling the torches and moving them from their prescribed location at the end of the robotic arm. As a result, the operators would have to call in a weld tech to readjust and recalibrate the process, leading to downtime.